So, England have crashed out of Euro 2004 in the cruellest possible way, yet again, on a penalty shootout. Michael Owen gave us all hope in the 3rd minute when he made it 1-0. Portugal then battled for 80 minutes and to be fair were the better team and eventually got an equaliser in the 83rd minute from Helder Postiga. This is where things get frustrating… on the 89th minute Sol Campbell hits the crossbar but gets the ball in the net on the rebound in a undisputable goal. Undisputable unless you’re a referee who disallowed it! I’m by no means a bad loser, but we deserved to win after that goal!! Extra time beckoned with the score at 1-1. Portugal scared England by making it 2-1 with a goal from Rui Costa but things looked better for England when Frank Lampard made it 2-2. England headed for a penalty shootout. David Beckham took the first penalty – and missed! This just summed up this Euro 2004 campaign – rubbish! Why is he playing for England let alone Captain!!?? Portugal missed 1 penalty and it went to sudden death. Daris Vassell had a penalty for England saved and the Portuguese keeper took the following one and won the game. All in all disappointing although the England squad did us proud and we look forward to the World Cup in 2006. The only negative was David Beckham. Also, without wanting to dwell on it, if we had a better referee we would have won the game! Euro 2004 produced some very interesting games this evening! 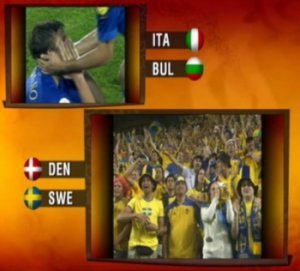 With tonight’s results ending 2-1 to Italy against Bulgaria and a 2-2 draw between Sweden and Denmark, it means the Italians are going home. To make matters more interesting (or distressing if your Italian), Italy scored in the last minute of the game. Running over to the dugout to celebrate, their ecstasy turned to heartbreak when they learned they were still out. Yes, England have beaten Croatia in what can only be described as a fabulous game of football and therefore qualify for the quarter finals against the host nation Portugal. Croatia worried England with an early goal, although it wasn’t long before we got a goal back thanks to Paul Scholes (ok, he plays for ManUtd, but when he puts on an England shirt he’s great). Wonder kid Wayne Rooney got a second just before half time, from one of the best goals I have ever seen. England made things better in the 2nd half when Rooney made it 3-1 before being substituted to guarantee he would play in the QTR Finals. Croatia worried England fans a little when they made it 3-2, although we were reassured of the victory when Frank Lampard made it 4-2. I watched the game in the local pub which had a great atmosphere and was probably the next best thing to being at the game. Bring on Portugal for the quarter finals. 3 Lions on a Shirt!!!! No, I haven’t been bumped off by the mafia or abducted by Little Green Men – incase you were concerned I had been! I’m back with updates. Leeds United’s Alan Smith became Manchester United’s Alan SCUM Smith. Big Brother started a fifth season on Channel 4. I also got my PC which works very well!